Home » Service Manual Catalog » EPSON Adjustment Programs » InkJet printers » AP_XP340 I have paid for Reset Key but not received yet. Epson XP-340, XP-440, XP-446 (EAI) Ver.1.0.1 Service Adjustment Program New! 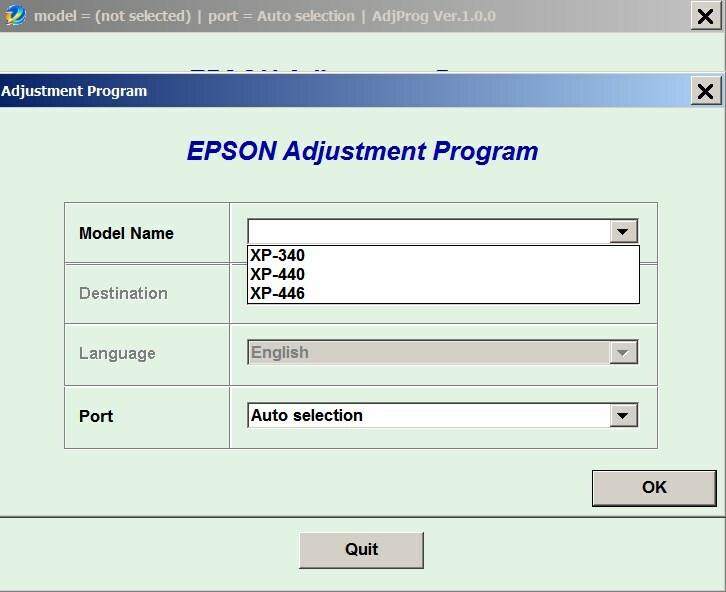 The Epson Adjustment Program for New models Epson XP-340, XP-440, XP-446 can be used under Windows only (Millenium, 2000, XP, Vista, 7, 8, 10 [in compatibility mode]). We recommend reading the Epson XP-340, XP-440, XP-446 Service Manual before using the adjustment utility. Wow thanks guys,this R265 has been in my cupboard for over a year because I couldn\'t find a reset Programme. I\'m absolutely astounded that it works and how easy it was. MANY THANKS. John, On your word and based on testimonials I purchased they reset key. Worked perfect up until this point and even ran it through multiple head cleanings. Artisan 710 running again and saved a lot of money. Thanks. Notify me of updates to Epson XP-340, XP-440, XP-446 (EAI) Ver.1.0.1 Service Adjustment Program New!